SAMI – Self Defense and Martial Arts Institute is an internationally renowned and recognized training center. 900 square metres, 3 top equipped martial art gyms with separate fitness, reception and lounge facilities. 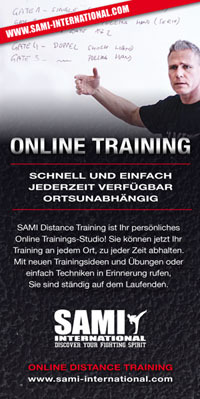 Established in Vienna, Austria in 2001 by Peter Weckauf and Irmi Weckauf-Hanzal the SAMI institute offers unique possibilities for martial arts and fitness training. With around 70 regular training hours/units per week in a multitude of disciplines the SAMI Institute is by far the largest and most significant martial arts school both in the country and in the Central European region in general. The SAMI Institute is also the headquarters and homebase of SAMI International and serves as the event location for all SAMI Combat Systems intensive instructor seminars and courses held directly by SAMI International.